Starting in the late 50s throughout Pontiac's glory days, two men who put indelible marks on this great period were Jim Wangers and Art Fitzpatrick. Jim Wangers, the "Godfather of the GTO" for his tireless marketing and promotion efforts. Art Fitzpatrick, who with his partner Van Kaufman (Fitz & Van), produced some of the greatest car art of all-time for Pontiac's Wide-Track advertisements. 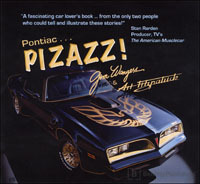 Now, both in their 80s, Jim Wangers and Art Fitzpatrick have collaborated on a new book, Pontiac PIZAZZ! where they have assembled perhaps the best collection ever of GR-RRReat Pontiacs from those glory days. This 12x12-inch coffee table book features narrative by Jim Wangers, who was right there running through the gears, accompanied by 15 new paintings by Art Fitzpatrick, along with his commentary on the cars as well. Read about what went into the making of many of Pontiac's marketing triumphs like those of the '63 Grand Prix, the original '64 GTO and even the famed Monkeemobile. This book salutes the style and performance that made Pontiac the car to own then...and marvel over today!